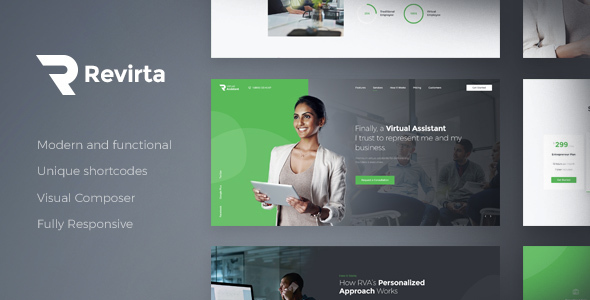 Revirta is an ideal WordPress solution for virtual personal assistants, advisors, aids, managers, people who provide administrative support remotely and virtual secretaries. The pure business design of the theme gives you maximum flexibility, and if you want to get more creative in building your website, you can add more layouts using the most popular WP Bakery Page Builder included at no additional cost. Revirta is perfect for both small and large-scale businesses. It can be used as a portfolio for a single virtual assistant or as a website presenting a whole big team of administrative support providers. If you use Revirta, your users will always be able to reach you â€“ whether they use large Retina screens, or their smartphones, since the theme is fully responsive with 100% Retina readiness. As a free addition, we have integrated the theme with the ThemeREX Addons plugin. Right after you activate it, you will noticeably expand the theme options, e.g you will be able to add 12 new widgets, CV Card functionality, image optimization option and much more!